Could racism damage 2018 World Cup? It was a new season but a similar story when it came to racism in Russian football last weekend. In the very first game, between FC Ufa and Spartak Moscow, Ufa's Ghanaian striker Emmanuel Frimpong (pictured above)was sent off for making an offensive gesture to the Spartak fans - triggered, Frimpong says, because he was being "racially abused for the game that I love". "I'm going to serve a sentence for being abused ... and yet we (are) going to hold a World Cup in this country," Frimpong added on Twitter. Zenit St Petersburg's Brazilian striker Hulk has now said racism happens at "almost every game" in the Russian league - and that it is a genuine threat to the 2018 World Cup. Hulk has repeatedly faced monkey chants in Russia, and the player has also accused a referee of racially abusing him. "If racism happens in the World Cup, it will be really gross and really ugly," Hulk said. It is a stark warning from the man who is the subject of the highest transfer fee in Russian league history. 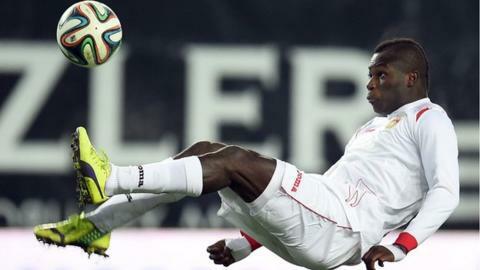 The Ghanaian Football Association has since said, in reference to the Frimpong incident, that it condemns the "vile racist abuse'' suffered by the former Arsenal player and called for the Russian Football Union, Uefa and Fifa to send "a strong signal'' to the perpetrators. Whether that signal will be received is another matter. After all, it is not the first time that players have spoken out about racism amongst fans in Russia. Ivory Coast midfielder Yaya Toure has even gone so far as to suggest black players could boycott the Russia World Cup. "If we aren't confident at the World Cup, coming to Russia, we don't come," he said. This came after Toure was racially abused by fans of CSKA Moscow during a Champions League match against his club side Manchester City. Uefa eventually forced CSKA to play their home match behind closed doors. A recent report by the Fare network and the Moscow-based Sova Centre for information has documented 99 racist and far-right displays and 21 racially motivated attacks during the last two seasons. These figures are disputed by the Russian government. To take one example: in 2011 Brazil's Roberto Carlos - then playing for Anzhi Makhachkala - had bananas thrown at him by Zenit fans. But more recently that has happened in Spain to Barcelona's Dani Alves, in Turkey to Galatasaray's Didier Drogba and Emmanuel Eboue and in Italy to AC Milan's Kevin Constant and Nigel de Jong. Or look at the way England's Under-21 match in Serbia in 2012 ended in a mass brawl and violence after racial abuse directed towards the England team's black players. And while Zenit fans launched an infamous "Selection 12" manifesto statement which demands an all-white team, there are equally notorious fans of clubs in Germany and Italy. Racist chanting and violence have long been reported by correspondents covering games of the German side Energie Cottbus, for example, while some of the fans of Rome club Lazio are known for their glorification of fascism. But that did not translate into particular racism problems in the 1990 World Cup in Italy or at the tournament in 2006 in Germany. Sorokin added that it was wrong to "just take individual outbreaks in the Russian Premier League and automatically extrapolate them on the World Cup, because the World Cup is a different atmosphere, it's a different public, if you will, so it doesn't reflect automatically on the World Cup". The first part of that statement is perhaps rather questionable, but it is certainly true that racist crowds at World Cups are not just down to the local fans. Contentious incidents at the 2014 World Cup in Brazil included "blacked up" German fans at the Germany-Ghana game - also during which a German neo-Nazi sympathiser ran onto the pitch - homophobic chanting by Mexican fans, and racist chanting by fans of Croatia and - yes - Russia. At the time, the head of Fifa's own anti-racism taskforce, Jeffrey Webb, admitted Fifa and the local organisers should have done a "much better job" of tackling these incidents. He suggested that the next World Cup will have three officials at every game trained to spot discriminatory behaviour. However, Webb now has rather different issues to deal with - he is currently on Rolex-and-Ferrari-guaranteed bail in the US accused of bribery worth millions of dollars - so his plans to tackle racism at Russia 2018 may have to be passed to someone else. Whoever succeeds him has a big challenge - to stop the spectre of racism blighting the tournament, whether it comes from fans from inside or outside of Russia.